Depending upon your tolerance for cold, a thicker or thinner wetsuit may be required or desired. If you are someone that tends to feel cold, err on the side of going with a thicker wetsuit. 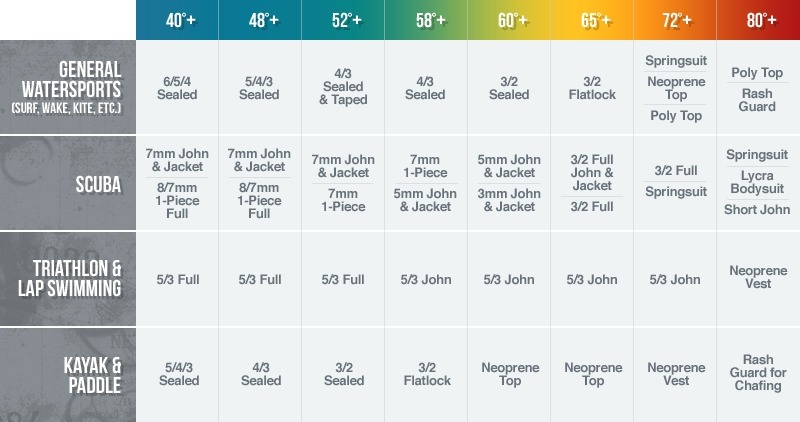 Otherwise, using the wetsuit thickness table should be a very good place to selecting the right wetsuit style and thickness. Also relating to air temperature is the amount of time spent in or out of the water. Air temperature will become even more important for a wakeboarder or waterskier, since most of the sport is out of the water. For a wakeboarder, if the air temps are 80+ but water only in the 60’s, a wetsuit top or springsuit could still do the job for most people. Conversely, a cool or cold fall day while the water is still warm could mean needing more coverage than usual. This also relates to the previous two considerations. Something you will have to take into account is the demand for high performance. The less wetsuit (meaning thinner and less coverage) worn will translate to high performance. If performance is at the top of your wetsuit requirement list, you may be inclined to buy a slightly thinner wetsuit or go with reduced coverage as applicable. Alternatively, if budget can accommodate, a higher-end wetsuit can provide you with appropriate insulation and very high performance. Lycra Rash Guards, Poly Fleece, Baselayers, etc. These items are primarily worn under wetsuits or alone, as sun and/or abrasion protection. These items do not provide thermal protection when worn alone, so they are only appropriate for water that is typically 75F+. These items provide wetsuit coverage to areas of the body. When a little insulation is needed and water temps are in the high 60’s, these types of products would be perfect. They also work well in heated swimming pools that just aren’t quite heated enough! Johns (men’s) and janes (women’s) are essentially sleeveless fullsuits. This style of suit is popular in layering applications, like SCUBA and kayaking. Johns & janes are also a popular style in triathlon/swimming style wetsuits, as this cut allows for full range of motion in the arms and shoulders. Fullsuits come in a variety of thicknesses for all water temperature conditions. In most cases, the thickness will be described with two numbers, such as 3/2mm. This means the majority of the suit is made of 3mm neoprene (wetsuit material) and the flex points 2mm. Manufacturers do this to enhance the comfort and flexibility of the suit. Fullsuits come with different seams. For water in the 60’s, flatlock stitching will work well. Flatlock stitches contain no glue, and will allow water to freely enter the suit at the seams. For that reason, you generally will not find flatlock stitches on anything thicker than 3mm. Sealed seams add glue into the construction. The seams are glued and stitched. This gluing helps dramatically reduce the amount of water that enters into a wetsuit. The less water entering your wetsuit, the warmer you will be! Liquid taping on top of sealed seams takes your wetsuit to another level! A rubber bead is applied to the outside of the seams to add durability to the seams and also further reduce the chance of cold water trickling into the suit. From here you should be well on your way to choosing the right wetsuit for your sport and water conditions. If you need some more help, we’ve got you covered! Give us a call, email, or live chat. We can assist you personally. Lauren (LoLo) has been picking out the latest and greatest wetsuits and being the social media queen for Wetsuit Wearhouse since 2014. She learned to surf for the first time ever in Costa Rica but she gravitates more towards SUP. When she's not scouring the web for travel deals, you can find her either hiking, running, practicing yoga, studying holistic nutrition or reading a good book outside on a beautiful day. I have a question. Should my shorty suit be the same size as my full suit? It depends. The easy answer is probably. However, if you are comparing different brands, or say a winter thickness wetsuit (like a 5/4/3 or 6/5/4) then it may be different. Every brand fits differently and sometimes a winter suit is one size bigger. If you’re unsure, give us a call (866-906-7848) or shoot us an email (service@wetsuitwearhouse.com) with more specifics and we’ll get your size figured out! That depends on what type of suit you’re looking for and the brand in which you’re looking at. You can check out our blog post on sizing, which might help you: https://www.wetsuitwearhouse.com/blog/choose-wetsuit-size/. And please feel free to reach out to our customer service and they will better help you find exactly what you need! You can either call, 866-906-7848, live chat, or email service@wetsuitwearhouse.com. Thanks! I am 5 foot 10, 150 lbs women. I swim in cold lake water all year round. What type of wetsuit should I purchase for the coldest months with warmth being the highest priority with some flexibility to swim? I have begun using 2 wetsuits recently: a shorty under a 3/2 hyper flex full suit which works quite well but would be easier to just use one suit re keeping warm on exit from lake to re-clothing? Thank you! Thanks for asking. Since you want a wetsuit strictly for swimming, we recommend this triathlon wetsuit: https://www.wetsuitwearhouse.com/PROD/S853WB-04.html#.WFRAbn1WUV0. This fullsuit is 5mm thick so it should keep you pretty warm while giving you that range of motion you need for swimming. Feel free to contact our customer service team for any help with sizing. Call us at 866-906-7848, or email service@wetsuitwearhouse.com. Thank you! Thanks for reaching out! Neoprene does lose elasticity with age, so that is probably why they feel tight. As far as a fullsuit goes, for what you need, we recommend this 3/2mm back zip fullsuit: https://www.wetsuitwearhouse.com/PROD/SX832WB.html#.WFgAOX1WUV0. And for a 3mm shorty, we recommend any of these: https://www.wetsuitwearhouse.com/wetsuits/category/womens-scuba-springsuits.html#/?_=1&filter.sports_combined=SCUBA&page=1&filter.thickness=3%2F2mm&filter.thickness=3mm. If you need help finding exactly what you need or help with sizing, please feel free to contact our customer service team either via phone (866-906-7848) or email (service@wetsuitwearhouse.com). Hope that helps and thanks again! Thanks for asking! The 5mm Henderson is a great choice for what you’re using the wetsuit for. As far as sizing goes, we’d need your bust measurement to give you the best fit but, from your height and weight, it sounds like you should try the size 8. If you need more help with sizing, please feel free to contact our customer service team either by phone, 866-906-7848, or email, service@wetsuitwearhouse.com. Hope that helps! I am trying to get a wet suit for a partner 5 feet 7 inches weighs 160 waist 34 . He swims in chlorinated pool 4x’s a week making laps swim in an outside pool 45+ temp. He likes front zip . What should I get him. Thank you. Because he is lap swimming, we always recommend going with a full triathlon wetsuit for that purpose and those water temps. Unfortunately, we do not have any front zip triathlon suits in stock. If he is OK with not getting a front zip suit, here is our selection of tri suits: https://www.wetsuitwearhouse.com/search.html#/?_=1&filter.gender=Men%27s&page=1&filter.sports_combined=Triathlon&filter.suit_type=Fullsuits. If you have any more questions or need more assistance with finding the right suit, please feel free to contact our customer service team by either phone, 866-906-7848, or email, service@wetsuitwearhouse.com. Thank you! I am looking for a wetsuit to carry on my sailboat…to be used on an infrequent basis (hopefully) for emergency scuba dive and/or underwater maintenance purposes…anticipate time in water to be 15-20 minutes max’ at a time, perhaps 2-3 times in succession, with breathers in between (e.g., to unwrap a line fouling the prop/drive shaft. I sail in the Puget Sound/Salish Sea waters that are about typically around 45 – 55 degrees F (winter vs. summer). I am 5’9″, hover around 170 lbs., have a long upper torso, 29″ inseam, 33″ waist, and wear a size medium polo shirt). Can you point me in the right direction for style, thickness, material(s), etc. in a durable, but not overly costly wetsuit? Thanks! Based on what you wrote, you could get away with this 5mm Men’s NeoSport XSPAN Fullsuit in a size Large: https://www.wetsuitwearhouse.com/PROD/SX850MB.html#.WIYljH1WUV0 or, if your budget is a little higher, this 5mm Men’s O’Neill suit: https://www.wetsuitwearhouse.com/PROD/2377.html#.WIYlpn1WUV0 in a size LS. If you still need additional help or have any questions, feel free to contact our customer service team either via phone, 866-906-7848 or email, service@wetsuitwearhouse.com. Thank you! Im six ft three. Never wore a wetsuit. All I need is warmth in the pool and ocean playing w grandson. Is .5 all I need? It would depend on the water temperature. If the water temps are always going to be over 70, you could get away with just wearing a wetsuit top, which will vary in thickness from .5-2.5mm and you can find those here: https://www.wetsuitwearhouse.com/search.html#/?_=1&filter.gender=Men%27s&page=1&filter.suit_type=L%2FS%20Tops&filter.suit_type=S%2FS%20Tops&filter.suit_type=Vests. If you don’t like the cold water, or the water will be below 70, consider a shorty (one piece, short sleeve, short leg) or a 3/2mm full wetsuit. Find the shorty springsuits here: https://www.wetsuitwearhouse.com/search.html#/?_=1&filter.gender=Men%27s&page=1&filter.suit_type=Shorty%20Springsuits and the 3/2mm full wetsuits here: https://www.wetsuitwearhouse.com/search.html#/?_=1&filter.gender=Men%27s&page=1&filter.suit_type=Fullsuits&filter.thickness=3%2F2mm. Need additional help? Please feel free to reach out to our customer service team either via phone, 866-906-7848 or email, service@wetsuitwearhouse.com. Thank you! We would recommend the 3/2mm Women’s NeoSport XSPAN Fullsuit: https://www.wetsuitwearhouse.com/PROD/SX832WB.html#.WPEEN2e1uUk. In order to get an exact size, we would need more measurements from her. Please feel free to contact our customer service team either via live chat, email (service@wetsuitwearhouse.com), or call 866-906-7848. Thank you! I have some questions about purchasing a wet suit. We have passed this information on to our customer service team. Someone will be in contact with you shortly. Thank you! Should I buy a “skin suit”? Will that add warmth? Hey Bob! Typically, skin suits are made of lycra and not neoprene, so they don’t provide any added warmth. Some skin suits can be made of polyfleece which serves as a baselayer under your wetsuit at best. You’re better off with a sufficient wetsuit to meet all of your needs! Hi! How much buoyancy can I expect from a 3mm jacket or best alone. I’m thinking of getting one for a big guy 4XL to use for snorkeling. The snorkel vests I’ve seen don’t come that big. Thanks. You’ll probably expect nothing noticeable. A lot goes into calculating wetsuit buoyancy (individuals weight, thickness of suit and type of suit) and with such little coverage as a vest gives, and its relatively thin neoprene, I would not expect you to notice any significant buoyancy. Hope that helps! I’m a size 6 female. Im 5’10”. I weigh 133 lbs. 29″ waist, 36″ bust and 36″ hips. I have a 35″ inseam and long arms. I waterski in Oregon in the spring, summer and fall. It’s about 50 degrees in the mornings in the spring and fall, so it’s pretty chilly. Any recommendations? Thanks for asking! Based on those water temps, we would recommend a 4/3mm full wetsuit. Here’s our entire selection of women’s 4/3mm fullsuits: https://www.wetsuitwearhouse.com/search.html#/?_=1&filter.gender=Women%27s&page=1&filter.suit_type=Fullsuits&filter.thickness=4%2F3mm. As far as sizing goes, here are a few suggestions. A size 10 in this suit: https://www.wetsuitwearhouse.com/PROD/XV843WB.html; a size 10 in this suit: https://www.wetsuitwearhouse.com/PROD/ARJW103040.html or size 12 for this suit: https://www.wetsuitwearhouse.com/PROD/2740.html. If you need additional help with finding the best option, please feel free to reach out to our customer service team either via live chat, email (service@wetsuitwearhouse.com) or call (866-906-7848). Thank you! Hi! Thanks for reaching out. Tough to recommend a suit unless we know what sport he is using the suit for. He will probably need a size L. Do you mean a 40/42 chest (you wrote shoulders. This measurements should just be around the chest under his arms)? If he is a 40-42 chest, a large from most brands should fit well. If you need more help for a sport specific suit, check with customer service at 1-866-906-7848 or service@wetsuitwearhouse.com. Check out the Thermoprene line in size 3XL: https://www.wetsuitwearhouse.com/wetsuits/category/mens-scuba-2piece7mm.html#filter:zillabrand:Henderson. If you have additional questions or need more help, feel free to reach out to our customer service team either via live chat, phone (866-906-7848) or email (service@wetsuitwearhouse.com). Thank you! I am wanting to make my very first wetsuit purchase for swimming in freshwater lakes in Canada. I will be swimming in the spring, summer and fall. I generally am a little colder so I was thinking about getting a 4/3. My problem is that my size measurements fall all over the chart! I have no idea what to get. I am 5 foot four, my neck is 13 inches, my bust is 37 inches, my inseam is between 30 and 31 inches, my waist is 29 inches, and my hips are 39 inches. I am looking to purchase one of your Roxy full length wetsuits for snorkeling, stand up paddle boarding, surfing. I could really use a hand in order to help avoid a return. Based on what you said, it sounds like you’d fit into a 10S but we don’t have much in the way of the thickness you need that’s also in a size 10S, so perhaps a size 10 would work for you. The 4/3mm Roxy would be a better choice (warmth and comfort-wise) than the Henderson Thermoprene suit, unless you wanted to consider the 5mm Henderson Thermoprene PRO model (which costs a little more) but it offers a lot more flexibility: https://www.wetsuitwearhouse.com/PROD/AP850WB.html. If you decided on the Thermoprene PRO, the size 8 would fit well. Also, how much do you weigh? This will also help us determine what size you need. If you need additional help, please reach out to our customer service team either via live chat, email (service@wetsuitwearhouse.com) or call us at 866-906-7848. Thank you! Continued from comment above. After chatting with a few other people I think I need a 5 mm suit. Wondering about your Henderson thermopreen 5 mm. Can you tell me what size I would need according to my measurements in the post above for this suit, as well as The Roxy Syncro suit in the 4/3 mm? I’ve just taken up surfing, I’m not a good swimmer so I wear a life jacket (very uncomfortable) Is there a shorty suit that has a lot of buoyancy to help me feel more comfortable in the water without a lifejacket? There are no wetsuits with any significant buoyancy. They will not provide any float. Hope that helps, thank you! Hi Gina. Gonna go Canyonnerrring in the Sierra Nevada. Probably 50degree water for 6hrs a day…in and out of water all day. Outside temp will be about 80 85 ish. What do you recommend? Thanks. Sorry for the delayed response! As far as what we recommend, if the water is going to be around 50 degrees Fahrenheit, check out a 4/3mm full wetsuit. Here is our entire selection of 4/3mm men’s wetsuits: https://www.wetsuitwearhouse.com/wetsuits/category/mens-fullsuits-43.html. With those outside temps though, you can get pretty hot in a 4/3mm (it will really help you in those water temps though). You could also look into layering pieces like pants and a wetsuit top to shed layers when you’re not in the water. Here is that selection as well: https://www.wetsuitwearhouse.com/wetsuits/category/mens-wetsuit-tops-bottoms.html. Thank you! I am 6’1″ and 215 pounds. I surf in southern California and I DO NOT get too cold in the water, but want something to protect from rashes on chest and the inside of my legs which rub on the surfboard. So I was thinking of getting some type of spring suit which hopefully will alleviate the rash situation. I want something that will not restrict me from paddling etc. What would you recommend? For the protection you are looking for and since you do not need anything that adds warmth, a shorty springsuit is a great option. Since you don’t want anything that might restrict your paddling, we recommend a 100% stretch shorty. We have a few great options and based on your height and weight, you should try a 2XL. However, measure your chest and compare your chest measurement to the size chart listed on the product page. Here is a link to our selection of 100% stretch short sleeve springsuits in a size 2XL: https://www.wetsuitwearhouse.com/wetsuits/category/mens-springsuit-wetsuits.html#/filter:mat:100$2525$2520Stretch/filter:sports_combined:Surf/filter:sizes:2XL. I need a wet suit for fly fishing, kayaking. 5’9 250lbs. What might you suggest. Do you happen to know the water temperatures for when you’ll be kayaking? For moderate water temps, layering pieces like long janes and long sleeve jackets (especially front zip tops) are a kayakers-favorite. Check the selection for those here: https://www.wetsuitwearhouse.com/SEARCH.html#/filter:sports_combined:Paddle/filter:gender:Women's/filter:suit_type:Long$2520Johns/filter:suit_type:L$252FS$2520Tops. Also, when finding the best size, use your chest measurement first, as well as your waist, height and weight. Hope this helps! If you have any more questions or need help finding the best suit, feel free to call us at 866-906-7848, email us at service@wetsuitwearhouse.com or live chat us! Thank you! Hello. I just got SDI certified only last week. I’m planning a dive trip to Mauritius the beginning of May (in 3 weeks). I understand the water temperature will be 78 deg F. I’m 50 yrs old, 5’9″ and 190LBS. Could you please advise if I should wear a 3mm or a 5mm wet suit. I also like high performance. I would also appreciate a recommendation on what suit would be best. Based off of those water temps and the fact that you want a high-performance suit, I would highly recommend checking out this 3mm Henderson Thermoprene Pro Shorty Springsuit: https://www.wetsuitwearhouse.com/PROD/AP630MB.html. This line of wetsuits offers 250% stretch and is perfect for diving. To find the best size, go off of your chest size first and then your height. If you need additional help, please feel free to contact our customer service team either via live chat, email (service@wetsuitwearhouse.com) or call 866-906-7848. Thank you!